We haven't heard much about Pirates of the Caribbean: Dead Men Tell No Tales, which is set to hit theaters next summer. Today we have the first trailer preview, which doesn't feature any actual footage, but does reveal that the first look trailer will debut tonight on AMC, during the Fear the Walking Dead season finale. Sadly we don't get to see Johnny Depp as Jack Sparrow here, but hopefully we'll get to see this beloved character when the sneak peek footage drops tonight. Thrust into an all-new adventure, a down-on-his-luck Captain Jack Sparrow finds the winds of ill-fortune blowing even more strongly when deadly ghost pirates led by his old nemesis, the terrifying Captain Salazar (Javier Bardem), escape from the Devil's Triangle, determined to kill every pirate at sea...including him. Captain Jack's only hope of survival lies in seeking out the legendary Trident of Poseidon, a powerful artifact that bestows upon its possessor total control over the seas. This trailer preview debuted on Facebook earlier today. 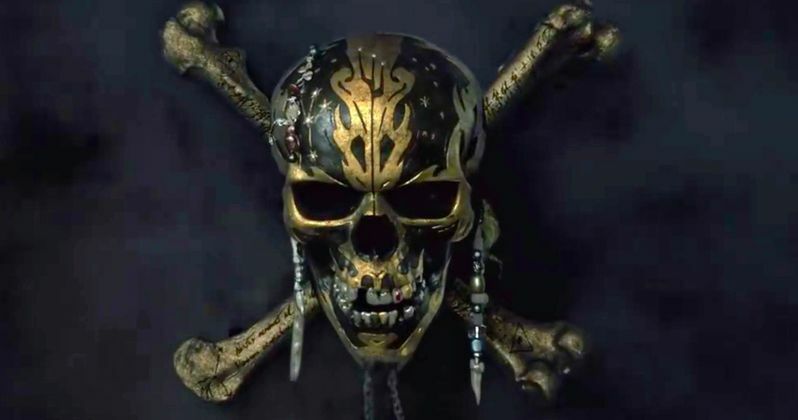 The supporting cast includes newcomers Kaya Scodelario, Brenton Thwaites and Golshifteh Farahani, along with returning fan favorites from the Pirates of the Caribbean franchise such as Geoffrey Rush as Barbossa, Kevin McNally as Joshamee Gibbs and Stephen Graham as Scrum. We also reported last year that music legend Paul McCartney will play a brand new character, but no details about his role have been revealed. It isn't known at this time if Paul McCartney's character will be showcased in this new trailer debuting tonight. Joachim Rønning and Espen Sandberg are directing this high seas adventure, from a script by Jeff Nathanson. Disney has set a May 26, 2017 release date, wich puts it up against Sony's sci-fi thriller Life, starring Ryan Reynolds. Production on this highly-anticipated sequel took place in Australia last year. The Pirates of the Caribbean franchise has earned $1.2 billion domestically and $3.7 billion worldwide from just four movies. Take a look at the trailer preview below. Then check back later tonight for the full Pirates of the Caribbean: Dead Men Tell No Tales trailer.